In spring 2016, the EU co-funded Preparedness and Prevention Project PACES has been launched, with the aim to develop housing for victims of disasters, tailored to the needs of the Mediterranean. Planning of locations for warehouses, logistics and prevented medical care. The project objective is to develop of operational procedures for the evacuation of people from disaster areas, as well as the construction of emergency shelters. Target persons are those with special needs, such as injured, physically and / or mentally impaired, as well as older people or children. On an online learning platform, the knowledge gained on earthquake risks should be made available not only to emergency organizations but also to the civilian population. PACES is an innovative project in which experts from five European countries work together to improve the organization and coordination of disaster relief and evacuation of large groups of people. In addition to international task forces, the team also includes organizations from countries that are often confronted with earthquakes and the consequences. More information about the project can be found on the project website. On 19 April 2016, the first Scenario Workshop of the EU PACES project took place in Heraklion on the island of Crete. 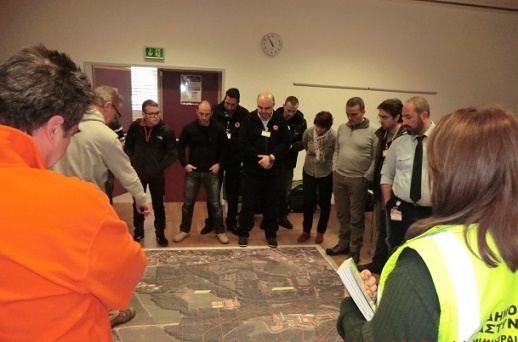 The first workshop dealt with seismic risk exploration and reaction planning. Sixteen lecturers from universities, international organizations, government agencies and emergency organizations from the partner countries Cyprus, Italy, Malta, Greece and Austria gave presentations in front of 100 participants from the Heraklion region on topics such as seismic risk assessment and earthquake scenarios, contingency plans for evacuation of victims and temporary shelters, as well as international cooperation and help. Read more this successful workshop on the following link http://www.paces-project.eu/index.php/en/events/scenario-workshop. On December 6th in Malta, the basic training course for mass evacuation and housing of the EU-funded Preparedness for Appropriate Accommodation in Emergency Shelters project (PACES) took place, dealing with the development of the provision of emergency shelters in case of disasters, especially for the Mediterranean. The partner country Austria will send up to seven participants from different task forces to this training course. Between 13 and 16 June 2016, the basic training course for emergency shelter and earthquake in Malta took place. In addition to the theoretical knowledge transfer about seismic risks, international aid, medical triage, emergency shelters, the planning of locations for warehouses, logistics and many other points that are important for the construction of evacuation centres, the participants were invited to a practical implementation of the learned. Emergency shelters have been set up in mixed teams from all participating countries, which, in addition to a coordinated structure, above all requires good communication among helpers of different origins and languages. As a special guest we were able to welcome the Maltese Interior, Justice and Defence Minister Carmelo Abela, who was also available to the participants of the training course for an exciting discussion about migration problems and camps. On Sunday 22 January 2017, 70 participants attended the workshop on mass evacuation and emergency accommodation in the training and education centre of the Styrian Red Cross in Laubegg. The participants were the project partners and trainees from the partner countries Cyprus, Greece, Italy, Malta and Austria. This three-day workshop started with an update on the current state of the PACES project. The following lectures were given on the behaviour of earthquakes and their impact on the earthquake-affected region. Here, the Austrian civil protection structure, the development of civil protection in the province of Styria, was presented to the participants. This first, very informative day was rounded off by the reports of experts from the Styrian Samaritans, the Austrian Red Cross, the International Organization for Migration, the United Nations, Caritas and the Italian Civil Defence of their real operations after the earthquake in Haiti in 2010 and 2016, in Nepal in 2015 and the earthquake in central Italy in 2016 and the tragic event that took place only a few days ago. We very much regret the misfortune that has happened in central Italy. Our thoughts and hearts are with and with the Italian population and all concerned. For the second day the participants were divided into three small groups around themselves to deal more intensively with the issues of mass evacuation, emergency camp management and dealing with people with special needs in natural disasters and to gain their own experience in special exercises. In addition to setting up an emergency camp according to the Sphere Standards, the existing applications in an emergency shelter were discussed with the participants and potential for improvement was worked out. As a special highlight of this exercise, the topic turned out to be people with special needs, such as people with physical or mental disabilities, children and the elderly. In this program, participants were given the help for a person to be rescued with special needs, with aids such as wheelchairs, crutches, blindfolds, babies to be rescued, and much more. The collected experiences were elaborated by targeted questions on the respective fields of application of the participants. 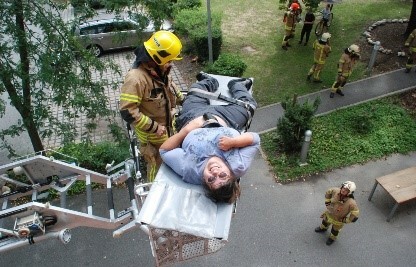 Exercise on dealing with people with special needs in case of disasters. This exercise was with great commitment by Mag. Monika Hirschmugl-Fuchs and Dipl.-Ing. Klaus Tolliner from the Ecobility working group of the Styrian Chamber of Commerce and received particularly positive feedback from the participants. On the closing evening, the participants were treated to Styrian delicacies. In addition to a warm buffet, excellent wines from the region, sponsored by the Fresnig-Kitzeck winery, were served. D.M.A.T. Consulting KG would like to thank all participants for their attendance and the dedicated cooperation in the workshops. 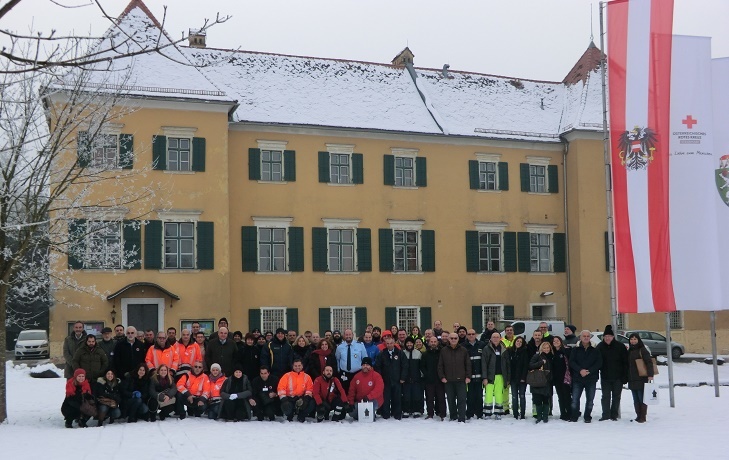 Special thanks also go out to all the supporters and helpers, to whom we owe the smooth running of the PACES Workshop with a focus on mass evacuation and emergency shelters, in particular the team of Schloss Laubegg. Press release_Notunterkünfte for ALL (in German). 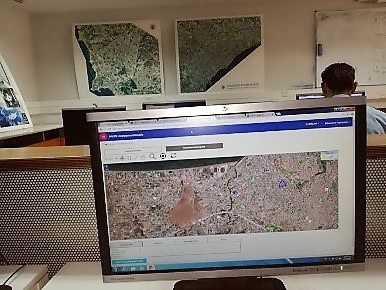 Between 22nd and 25th May 2017, a table top exercise was held from PACES in Rome to show the Italian Civil Defence, the Operations Center and the National Monitoring and Observation Center. As part of the simulation game, various tasks in the project were handled by the participants. The workshop was concluded with a visit to the Amatrice earthquake area, which was hit by severe earthquakes in August 2016 and January 2017. Thus, it was possible to show the participants the reality – it was all very affected to see how great the destruction in Amatrice was even after months. In June 2017, a field exercise took place in Cyprus. On the first day, various presentations were made on the use of drones (UAV), triage, the rescue of people with special needs, psychosocial care for the injured and other exciting topics. Among other things, the newly developed warehouse management software (Camp Management Software) was shown in the training area, which includes the management and the coordination of camps. We find the developed software very successful! 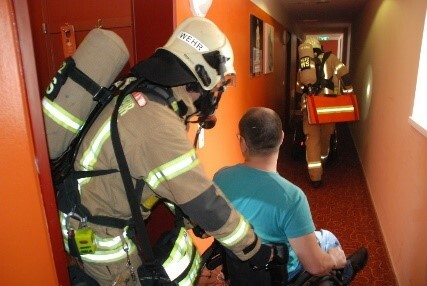 As part of the summer camp, which took place from 23 – 28 July in Graz, an evacuation exercise was conducted with the professional fire department of the city of Graz. The necessary rescue of 15 people with disabilities from the Youth and Family Guest House in Graz was a real challenge for all those involved. 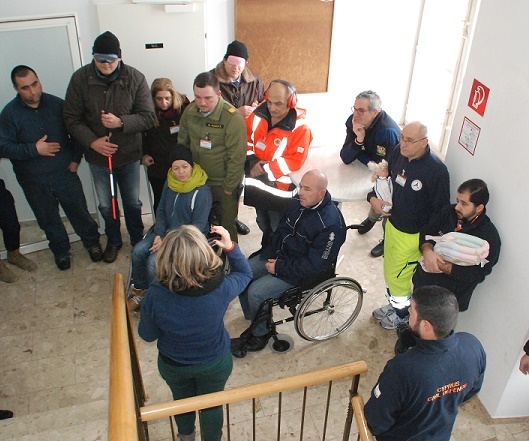 In the exercise it was assumed that three persons, two in a conventional wheelchair, and one person in an electric wheelchair had to be evacuated from a youth hostel. Watch in this video about the fire drill at the summer camp, filmed by Barbara Tolliner, section Klaus Tolliner, the exciting course of the exercise. We sincerely thank the participants of the summer camp for their support in the development of problems and solutions in the rescue of people with special needs, as well as for their active participation in the exercise! In October 2017, the final exercise for PACES took place in Crete. During the final exercise, the latest developments of the PACES project were reported. Emphasis was placed on the use of the scientific results for the seismic risk analysis of Heraklion. From this, the planning of squares in this area, for temporary camps after mass evacuations, e.g. due to an earthquake. Read more about the exercise in this article. In December 14, 2017, the final conference of the PACES project took place in Nicosia / Cyprus. The results from the individual areas of application were presented. It has been noted that in the past two years, major advances have been made in the area of ​​temporary housing for those affected by natural disasters and evacuations, including those with special needs. The project developed standards for selecting a suitable location for a warehouse, as well as for the operation of the warehouse, considering the needs of all people, using computerized warehouse management software. The universities were involved in the corresponding planning.